My hope certainly is that it will help educate people. 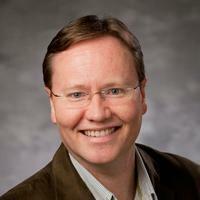 Mark Goodacre, [pictured, right] who’s the professor of New Testament and Christian Origins in the Department of Religious Studies at Duke University, is a featured expert on the series. He said recently that ultimately, viewers will have to decide whether to accept the findings as fact or opinion. "Well, I think [the series] is going to be elements of fact and opinion," Goodacre told The Christian Post on Friday. "Take Sunday’s episode, which focuses on the Shroud of Turin; there’s been a huge debate about the authenticity of the shroud over the last hundred years. Some people are convinced that it’s the real deal, I’m personally skeptical about its authenticity. I think that it’s much more likely to be a medieval forgery, but even then, I think it’s still fascinating as an artifact from the middle ages." Other expert commentary will be featured from the likes of Ivy League academics from Yale, Harvard, Princeton and Oxford universities who will provide theological insight. They include Erwin MacManus, senior pastor of MOSAIC Los Angeles, and Rev. Paul Raushenbush, executive religion editor of The Huffington Post, among others. Award-winning journalist and filmmaker David Gibson, who co-authored Finding Jesus along with Michael Mckinley, the book that inspired the CNN series, will also be featured. "My hope certainly is that it will help educate people. The best kind of education is when you get people asking questions," said Goodacre. "You get people engaging with the subject matter and they think, ‘that’s interesting, I want to know more about that,’ and they go and explore a bit more for themselves. I teach this stuff for a living, and I think the best kind of teaching is the one that gets people asking questions." I’m reading the accompanying book that just came out. The book has no footnotes, which I can understand, since it’s aimed for a general audience. But I’m disappointed in the Shroud chapter regarding the treatment of the reweave. While one peer-reviewed journal is mentioned in the text regarding another aspect, there is no mention of peer-reviewed articles pertaining to the reweave theory. Here is what is said about it: “Like every piece of new research connected to the shroud, the detailed findings from the 1988 radiocarbon tests raised doubts: the swath of cloth that was tested was not from the original shroud, but came from an edge of it that had been patched, and touched by many grimy fourteenth-century hands as the icon was moved from place to place.” If one is intending to educate an audience, I would think a little more thoroughness is warranted. Joe, may I ask one question? Did they mention any radiocarbon of any alleged piece of the True Cross? Mike, thanks for the link.Very interesting. The book indicates that a sample was taken for Oxford to sample but it doesn’t list any results so Oxford evidently has not completed the testing. We will see the results in TV. That’s what makes me most curious. The potential outcome may be groundbreaking -or not. They obviously don’t take the reweave theory seriously. The quote by Gibson was clearly headed in that direction–they just didn’t complete the thought. If they’re entertaining the idea that the Shroud could be authentic, there must be some explanation why the C-14 dating was wrong–but they didn’t offer ANY concrete explanation. But at least they mentioned the Sudarium. That disproves C-14 dating of the Shroud. BTW: is there any detailed description of the C-14 dating of the Sudarium in Gibson’s book? The book does not mention at all C-14 dating of the Sudarium. I have commented more than once on other threads that documentaries generally do not provide a complete picture, and sometimes they serve vested interests. That, for instance, happened in the case of the so-called Jesus family tomb documentary/book, which left respected academics furious. Ted Koppel was obliged to make a sequel and take the “archaeologist” who was spreading the sensationalism to task, otherwise it would signal the end of the credibility of the producers. A respected scholar called the documentary “archaeoporn”. An important part of burial customs and beliefs was seemingly deliberately left out, and it will be mentioned in part IV of the article on the Talpiot tomb. Louis, the link to the Catholic Herald article you gave refers to a meditation on the Ways of the Cross, and not specifically to any present relics of the True Cross. I presume that was your intention. I found a Wiki article quite informative. I had read (Thiede & D’Ancona) that a very large portion of the True Cross from Jerusalem was carried by crusaders into battle, but that it was captured by Saladin at the Battle of Hattin in 1187, and paraded around Damascus whence it disappeared. However the Wiki article says that it was only a small fragment originally discovered by Arnulf and embedded in a golden cross and kept by the Latin Patriarch of Jerusalem. Several other fragments were dispersed around Christendom, most of them from Constantinople and pretty well all of them made from olive wood. Helena is supposed to have found the Titulus with the Cross. 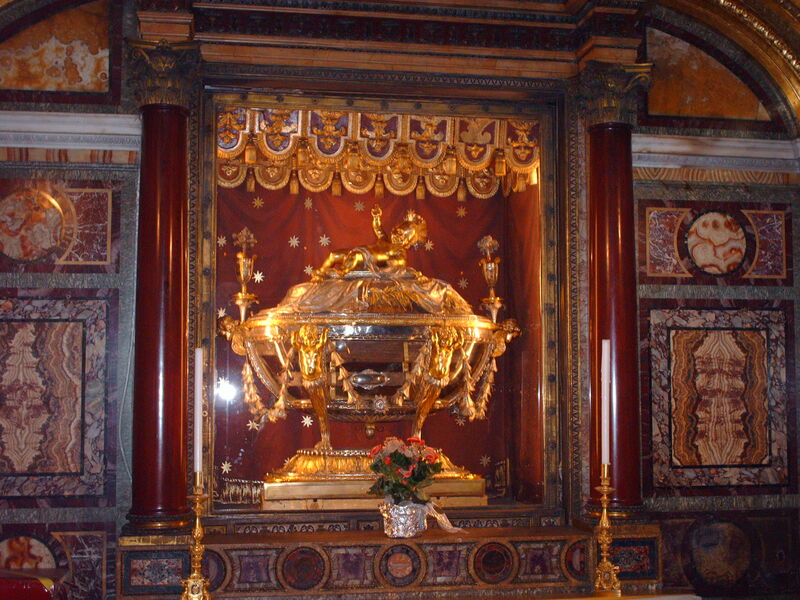 The present relic of the Titulus at St Croce in Gerusalemme in Rome is walnut. It was dated by Arizona in 2002 and claimed to originate between 980 & 1146 AD. However there seems little doubt that the original recovered relic certainly did exist as early as the 4th century, as there are several attestations to it. However the Wiki article says that it was only a small fragment originally discovered by Arnulf and embedded in a golden cross and kept by the Latin Patriarch of Jerusalem. Several other fragments were dispersed around Christendom, most of them from Constantinople and pretty well all of them made from olive wood. This Wiki statement about olive wood is weird. This reference to the olive wood seems unreliable. 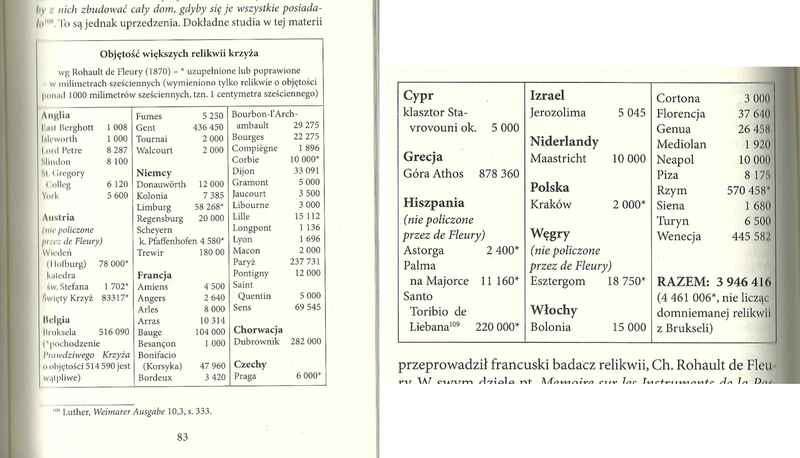 On the contrary, Hesemann states (in “Milczący Świadkowie Golgoty” -the polish edition of Die stummen zeugen von Golgatha, Wydawnictwo Salwator, Kraków 2006, pg. 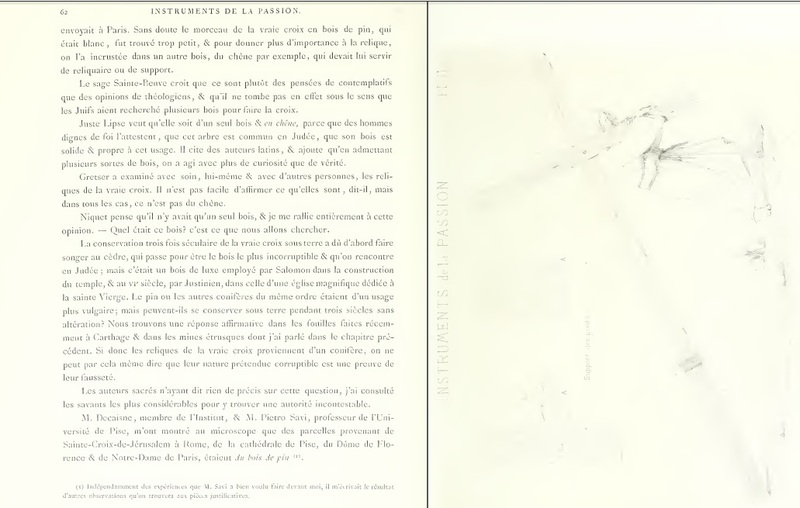 87-88) that the very same four pieces of the True Cross (Rome, Paris,Pisa, Florence) came from pine instead of olive (pointing to De Fleury, 1870 pg. 62). The examination of Vienna piece form Hoffburg gave the same results, while the wood from Santo Toribio according to the examination from 1959 came from cypress (although Hesemann makes a digression about margin of error in identification). Here is the list of major portions of the True Cross preserved today (via Hesemann pg. 83-84). 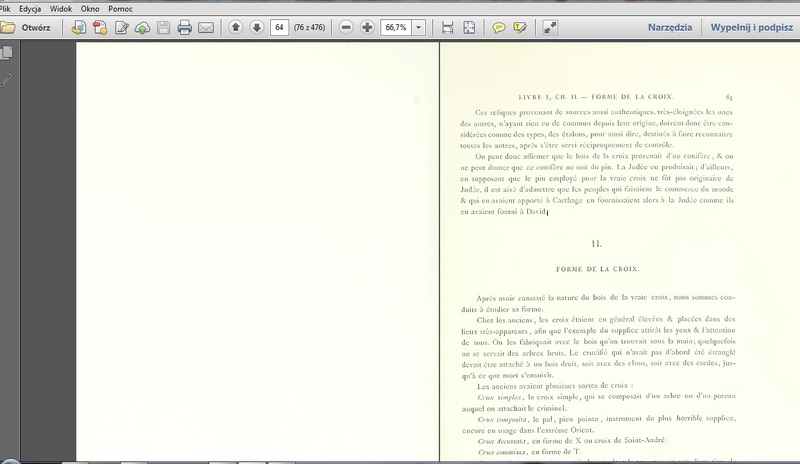 The volumes are in cubic milimeters. Wikipedia is totally unreliable by itself, this is well known. How curious! Olive is a very hard wood, quite valuable but not easy to work, and it would seem unduly wasteful to use it for a gallows. Pine is soft, cheap, much easier to work, but good gradings of it have adequate strength when seasoned and treated, even for roof trusses. NZ exports several tonnes of pine logs and chips to Japan, where it’s either used for paper-making or mixed with glues to create a stronger material. Many NZ houses use some pine in their construction. Cypress relics must have come from a different source. There are hundreds of relics first attested in the fourth and fifth centuries as this was the first period in which relics were considered to be a theologically acceptable way of worshipping God/ Christ. However, three hundred years after the Crucifixion , there is little evidence that any are actually genuine which was why I told the CNN crowd that if they did radiocarbon date an early fragment of the Cross to the first century to please let me know so that I could rewrite my first chapters of Holy Bones. Despite many documented accounts of specific Holy Land relics, no mainstream scholar specialising in ancient artefacts or early relic legends knows of any that are genuine. I have never heard anything but ridicule of Thiede from established scholars. Certainly his book on the titulus, which I have seen in Rome, was totally unconvincing and the carbon date reflects an age when many ancient objects were given relic status. I am in Lucca at the moment and again the Volto Santo, believed to have been carved by Nicodemus,has again come up medieval, as have other apparent relics that have been carbon dated. This does not mean ,of course, that they were designed as fakes, though some were, the majority was objects of lost origin which became associated with miracles or visions and so got their relic status that way. Common were stories of them travelling from the Holy Land, as the Volto Santo did In a boat without any oars! Actually the people of Lucca know that is it is medieval but this does not stop them having a wonderful feast day in September in which it is paraded through the streets. In the end whether a relic is authentic or not matters little in Italy so long as the festivals associated with it keep going! I do, however, think that believing Christians should also worry about the heavy crosses being carried by those in the Middle East and that Syrian Archbishop Samir Nassar’s pleas should not fall on deaf years. Re Titulus: CF: “I have never heard anything but ridicule of Thiede from established scholars.” Presumably that would be because Thiede & D’Ancona made a plausible argument that the Titulus might in fact be genuine, and we already know what close-minded scholars think about the survival of any genuine relics anyway. Publication of the authors’ book preceded the C14 dating of the St Croce relic. Whatever, the original relic certainly seems to have existed, being attested by Egeria 383, pilgrim Antoninus 6th c, Sts Cyril, Ambrose & John Chrysostom. The sequence of lettering on the present relic is: Aramaic/Hebrew, Greek & Latin, at variance with the gospel accounts. Curiously the Latin & Greek lines read from right to left, either from ignorance or as a parody of the Hebrew. These two features (language sequence, and the right to left script) would seem to argue against forgery in the earlier relic. It was hidden in 455 because of an attack by Visigoths, and not rediscovered until 1492 by workmen behind a brick inscribed “Titulus Crucis”. The C14 date of 980-1146 being some 400 years earlier. If present relic not genuine and the C14 date is correct, the lettering would seem to argue for a replacement replica rather than it being an outright deliberate forgery. Yes Daveb, I have read all these early accounts and they were convinced that if they found a manger in Bethlehem that it was the real thing. But that does not mean that it was. The start of relic cults is three hundred years on covering a time when almost no attention was paid to relics so there was no reason to preserve them. It needs a particular mind set to preserve relics which is why they are not part of many Christian traditions. Meanwhile only accept as genuine those relics that can be dated to the first century and have some other evidence to link them to the life of Christ. I don’t know of any but I was hoping that the CNN programmes might come up,with some. But if they have I shall be annoyed if they have not let me know- their researcher did promise! It is all there in my Holy Bones as I take the reader through the various phases. It is the fourth century that you first get sustained Christian relic cults, the deliberate use of relics as a means of accessing heaven through an object, using them as a talisman for good fortune ( e.g. Constantine using a nail from the Cross on his horse’s bridle) or using relics as mechanisms through which healing or the expulsion of demons ,etc, were effected. This is a much more sophisticated level than just preserving things and you get the first sustained theological arguments for the veneration of relics in the fourth century. The Wikipedia article, although pretty elementary, does mention the important figures in elevating relic cults such as Ambrose and Augustine. There were certainly memories of where some martyrs were buried but there was no systematic use of the actual dug -up bones being used as spiritual forces before the fourth century. Ambrose of Milan’s opportune discovery of the bones of Gervasius and Protasius in the 380s when he used them as a means of boosting his own reputation is one of the best known early examples and his transfer of some dust from them to Rouen one of the earliest examples of a translatio- the placing of a relic in an above ground shrine where it could be openly venerated. By 400 the emphasis was on public display, carrying relics in processions, having them in shrines,etc. No need for secrecy, in fact the opposite. There is no point in having a relic if you hide it away from veneration. Of course, in many cases the relics are new or are old bones ,etc, that are assumed to be genuine. So there are lots of stories of discoveries .e.g the bones of the martyr Stephen in Jerusalem in 415. No reason at all to think that they were the real thing and until any of these are actually dated to the first century or have some definite evidence of provenance then I am sceptical. There was just too great an incentive to produce a relic which was claimed to be authentic. So far, but we are waiting on CNN, not a single relic has been proved to be first century. No need to answer the rants of OK. The start of relic cults is three hundred years on covering a time when almost no attention was paid to relics so there was no reason to preserve them. I say straithorward: you are deliberately LYING! . It is THIRD time that I must correct this deceit cynically spread by you! The cult of relics is much earlier than Constatnine. In fact, it predated the origin of Christianity. Also cited is the veneration of Polycarp’s relics recorded in the Martyrdom of Polycarp (written 150–160 AD). With regard to relics that are objects, an often cited passage is Acts 19:11–12, which says that Paul’s handkerchiefs were imbued by God with healing power. It needs a particular mind set to preserve relics which is why they are not part of many Christian traditions. Yes -especially those Protestant traditions that originated 1500 years afterwards, and possesed no relics, and no previous traditions at all (thus they adopted sola scriptura principle). I can’t recall any pre-Reformation Church that doctrinally rejected veneration and prservation of relics by principle, even despite critical voices about cult or provenace of some relics raised from time to time. Can you fill out a bit of chronology for us, Charles. I understand there was a huge expansion in relic collecting from about 300 AD, presumably mostly in the East? I don’t think there was a great expansion in relic collecting about 300 AD, except for the Saint Helen and her pilgrimage to the Holy Land, where she rediscovered True Cross, and gathered many other relics. Simply since the Constantine, and the end of persecution, most of the relics (like Crown of Thorns for example) didn’t have to be hidden, and could be publically venerated. Before that time they were mostly kept in the judeo-christian society, and passed from generation to generation, in rather secretive way. Do any other allegedly 1st century relics appear later than 1350? Purported skeletal remains of John the Baptist have been dated to the first century A.D. and so could conceivably have belonged to the “forerunner of Christ,” who baptized Jesus, scientists say. Discovered in 2010 among the ruins of a Bulgarian church, the remains include six human bones: a knucklebone from the right hand, a tooth, part of a cranium, a rib, and an ulna, or forearm bone. DNA and radiocarbon testing of collagen from the knucklebone show that the remains likely belonged to a Middle Eastern man who lived in the first century A.D., which fits with the story of John the Baptist. Note every sentence ending in a query – I really have no idea, but would be grateful for your opinion. Truly Hugh, Charles’ biased, deceitful and misleading “opinions” are not worth a penny. He has discredited himself completely in this matter. In an interview with the late Professor Geza Vermes, teaching Jewish history at Oxford, I questioned him about Dead Sea Scroll fragment 7Q5 that Father José O’Callaghan believed to have been part of a Gospel and received support from Carsten P. Thiede. He dismissed the claim, and so did other biblical scholars I had consulted. Thiede also did not like the fact that my report mentioned the fact that he had used a computer to make the results of his quest more narrow. Biblical scholarship is 90 % trash, based on ideological paradigms instead of meritorical arguments, Louis. The most absurd claims can be traded as ‘scientifically established facts’, using complex sophistry developing nonsensical hypercritical assumptions, coming out from carefully hidden hidden anti-Christian stance. I agree with part of what you are saying as prejudice, hidden agendas and even hatred can be a part of the scholarship. Some of it gets to documentaries and books written by sensationalists who are able to fool the gullible. What happens next? Piles available for sale on sidewalks at 10% of the price, at least in Third World countries. I have often dealt with highly delicate questions during my work, it had to be done, one had to get straight to the point. There one hears some of the stuff you complained about. What has to be done next is hard to decide, but once a decision is made you have to go all the way through, expect to be the object of hatred. I tried to find a means to defend Carsten Peter Thiede, having read the book he co-authored with Matthew Ancona, but had no success. Other important biblical scholars I spoke to, all of them practicing Christians, did not accept his hypothesis. As someone who has room in a website devoted to apologetics I am sure you know who the best scholars are, they are few, outnumbered. The sceptics and anti-Christian authores form an army. Yet, the work must go on…. The biggest contribution of Thiede is, in my opinion, not his controversial hypotheses (with which you can agree or not), but something else -that he broke sceptical paradigms and showed that the other, more pro-Christian views on biblical scholarship are in fact neither impossible nor inferior by any means compared to the so called ‘critical’ approach. Don’t worry, OK, I value your opinions too.The trouble is, it’s difficult to substantiate an opinion of secrecy – the idea that there was a relic culture but it was too secret to leave any trace is possible, but the evidence for it seems to be exactly the same as for the idea that there was no relic culture at all. I wonder how you know your opinion is more likely to be correct than Charles’s. As for the bones of John the Baptist, they appear to have been part of the 4th or 5th century enthusiasm for relics, having had whole churches built for them. What I was looking for was any “newly discovered” relic appearing after 1350, without any obvious previous provenance. When did all the Crowns of Thorns and Tunics, Lances, Nails, Swaddling Clothes and stuff appear in Western Europe? Wasn’t it earlier? The trouble is, it’s difficult to substantiate an opinion of secrecy – the idea that there was a relic culture but it was too secret to leave any trace is possible, but the evidence for it seems to be exactly the same as for the idea that there was no relic culture at all. If you have any orientation in ancient history (especially the number and condition f preserved written sources and historiography) you will know that is one should expect. There were little written records of relic cult before 300 AD, yet there were a few, showing us that the relics were in fact venerated, although not openly like after Constantine. Besides people who took care about them rarely left written records. Writing history besides was rather Greek and Roman (and on the other side of the world Chinese) hobby. 90 % of historical Jewish writings comes from two sources: the Bible and Josephus (who wrote in Hellenic manner). There are no preserverved historical writings from Persians for example , up to the Arab conquests. There are no Persian, or Parthian Herodotus nor Livy, nor Sima Qian. The same is for Indinas, there are only a couple of historical writings in India before. 1200 AD. So the lack of records is fully understndable. When did all the Crowns of Thorns and Tunics, Lances, Nails, Swaddling Clothes and stuff appear in Western Europe? Wasn’t it earlier? The main periods of major transfer of relics from the East to the West are 1.) The Persian conquest of the Holy land in 614 when several relics were trnasferred to Spain 2.) The Charlemagne times circa 800 AD, 3.) The outcome of the 4th Crusade, when several relics were looted, or sold to the West. Of course diplomatic relations brought several pieces of relics (a few thorns for example) to the West at different times. If you are interested in history of relics, Micheal Hesemann’s Die stummen zeugen von Golgatha are must read. Besides Grzegorz Górny Witnesses to Mystery as illustrations (Górny in fact derived half of the text from Hesemann if you read the two carefully). Yes, that was one positive aspect of C.P. Thiede’s work. M posting made no reference to some random cattle feeding trough found in some Palestinian barn by an over-enthusiastic credulous relic pillager. A closer reading would make it clear that it referred to a specific walnut headboard purporting to be the notice of condemnation prescribed by Pontius Pilate, and inscribed in a rather peculiar but totally relevant and plausible way, and subsequently attested by totally reputable and historic persons, commencing in the 4th century, allegedly being that relic recorded as being discovered by Helena, mother of Constantine the Great. M posting made no reference to some random cattle feeding trough found in some Palestinian barn by an over-enthusiastic credulous relic pillager. With respect to the birth of Jesus in Bethlehem, if any one desires, after the prophecy of Micah and after the history recorded in the Gospels by the disciples of Jesus, to have additional evidence from other sources, let him know that, in conformity with the narrative in the Gospel regarding His birth, there is shown at Bethlehem the cave where He was born, and the manger in the cave where He was wrapped in swaddling-clothes. And this sight is greatly talked of in surrounding places, even among the enemies of the faith, it being said that in this cave was born that Jesus who is worshipped and reverenced by the Christians. Here you have the photo of the remmants of this manger, described by Origen around 250 AD, and transferred to Rome, to the Basilica di Santa Maria Maggiore in the VIIth century by patriarch Sophronius, after Muslim invasion. The tradiion of it seems fully trustworthy. It is only inconceivable for primitive pseudo-sceptics like Charles. -The sample provided for the carbon-dating test was taken from a patch sewn into the cloth in the 14th century following a fire which damaged it. -A cloth purported to be the Shroud was kept in Jerusalem, Edessa and finally in Constantinople from the time of the death of Christ until it was taken from Constantinople by Crusaders. -Christos Pantokratur – a Byzantine painting that goes back to the 5th century. Rogers overlaid the head on the Shroud onto this painting and clearly demonstrates that it’s the same person – exact forehead, nose, chin, hair-line, size, etc. Rogers concludes that the early Christians were familiar with the Shroud, although not many had access to it due to the fear that enemies of Christianity would destroy it, and that the face on the Shroud was used as a model for early Christian artists. Just take a look at some of the ancient art depicting Christ. It’s the same face as on the Shroud. I saw it for myself in a church in Greece that goes back 1,500 years. Rogers concluded that the Shroud is the burial cloth of Christ. Another item missed – an Israel scientist found pollen on the Shroud from plants growing only in Jerusalem which pollinate only in the Spring. Christ was crucified in the Spring. There is also pollen from plants found only in Edessa and Constantinople. How, in God’s name, would a forger from 14th century Europe even think about getting pollen from Jerusalem? It’s invisible to the naked eye! There is also residue on the Shroud where the knees made contact containing dust and particles from dirt and stone found only in Jerusalem. On a final note, getting back to Rogers, he does not know how the image got on the Shroud (and neither does anyone else), but he did add that it would have had to appear within the first 4 or 5 days of death, because by that time liquids would begin to ooze from the body creating an unrecognizable mess, not a clear, concise, detailed image that we have.